ACS Alarm Control System ensures that alarm management and notification is automatic, efficient and reliable. ACS dispatches notifications to the right person based on the time of day and the competency necessary to respond to the task. The closed-loop system ensures that all alarms are acknowledged, resolved and closed. ACS Alarm Control System is a software application that automatically dispatches safety, business-critical alarms and work tickets to digital two-way radios, iOS/Android devices, and other mobile devices. When an alarm is raised or a work ticket is generated, ACS immediately identifies the available employee and sends the notification. ACS works as a closed loop system, and the alarm or work ticket is escalated until it is acknowledged. Users respond to the notification to update the alarm or work ticket’s status as it is accepted or declined and closed. ACS ensures that the alarm and work ticket notification process is automatic, efficient and reliable. Integrating into building management & network systems. Smart Tickets work with MOTOTRBO radio and ensures that work ticket management runs smoothly from beginning to end. As a team member accepts and closes a work ticket, the remaining group members’ radios automatically update the work ticket’s status. ACS consolidates disparate alarm sources and manages the alarm notification process. By doing so, response times to alarms and urgent events are significantly reduced which leads to an increase in workplace efficiency. With ACS, generic alarm outputs are transformed into actionable work tickets sent only to the appropriate individuals. The ACS reporting features allow managers and administrators to track how long it takes to respond to an alarm or work ticket, accept it, and close it. 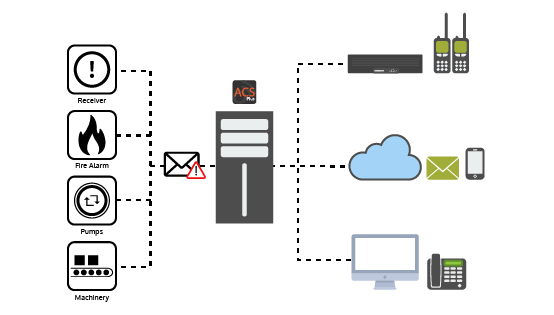 ACS is a software application installed on a server which automatically notifies the appropriate individuals of alarm notifications, emergencies and work tickets directly on their mobile device. The server interfaces to third-party alarm systems, work ticket management systems, building management systems, and other alarm generating sources by listening for alarm triggers. ACS can notify employees on the device of their choice. 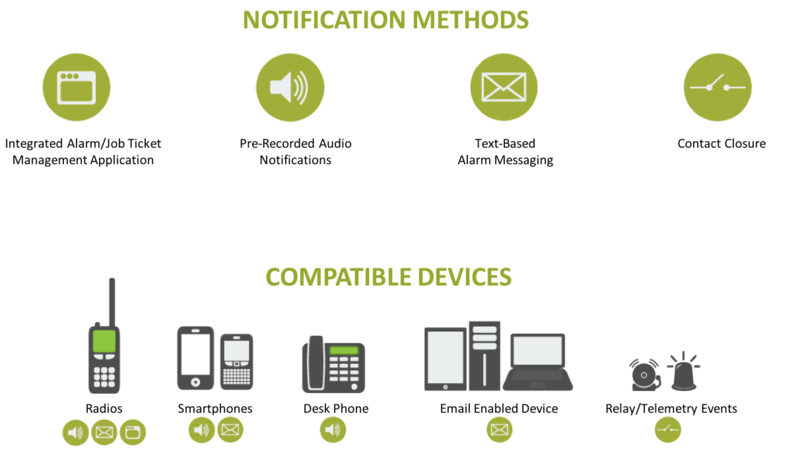 It sends notifications via email and text message, as well as text and audio notifications to radios, iOS and Android devices.